Looking back to my art successes — both personal triumphs and award recognition — some credit goes to my art groups. Getting feedback on my work from other artists is SO valuable. I consider it to be my single most effective resource for inspiring and improving my work. 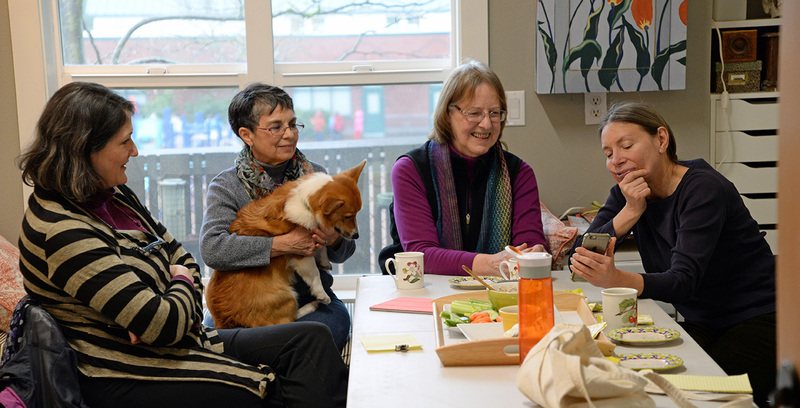 Some groups create an incentive to produce art — after all, you’ll want to have something to show at the meetings! Plus, after a few hours of talking art you’ll be wanting to paint. Some groups get together to paint. 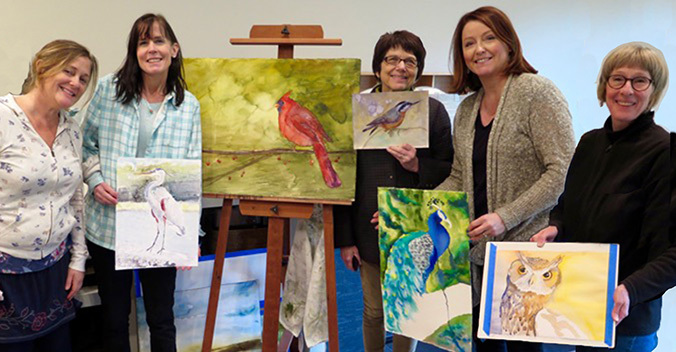 My fall 2015 bird class at Village Gallery decided to meet on their own to paint after the classes ended. Here they are with their paintings – some are in progress. Some groups offer an art critique. Cultivate a culture of respect and trust and you will have access to a wide range of ideas and possibilities. There are times when we get stuck with a painting and can’t figure out what it needs! Feedback from others is SO valuable. Most groups create friendships and a cross pollination of ideas. You might be introduced to the work of other artists or where to go to print greeting cards or how to set up a studio. I belong to a total of six different art groups now and they all have something unique and valuable to offer! I joined Westside Critique group 7 years ago. Through their camaraderie and support I have flourished! In working with this group I’ve discovered many of the techniques I use in my art today. We meet once a month and paint together each August at the coast. Two large and well established groups — Painters Showcase and Lake Area Artists — pool resources to put on art shows and sales. 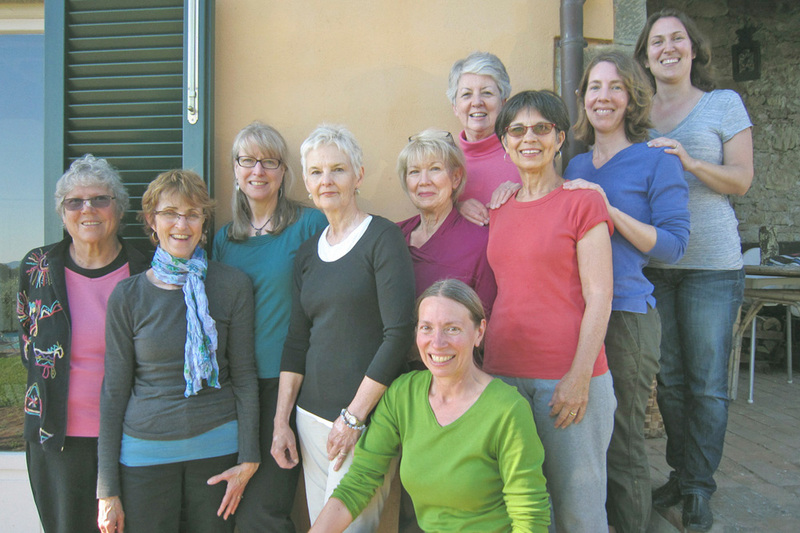 The very first travel workshop I led in Tuscany formed an art group of their own, The Melogranos. I am an honorary member and love being connected with them. The other two groups started in 2015. They are both intensionally quite small. The Moas, forming out of the momentum of an exploratory trip to France, offers camaraderie, inspiration and a strong emotional connection. Critical Mass has just 4 members but is a powerful “teaching” group that helps focus my art career. It began when Liz Walker asked if I would get together with her to critique our work. The next month we asked Geoffrey McCormack and Chris Stubbs to join us. We talk about contests, inspiration and sometimes the “business” of art. I very much recommend finding a group to join or starting one of your own. Determine how many members you want. Identify others who produce art regularly and embrace artistic growth. Look for artists who have integrity and are completely trustworthy. Welcome a variety of styles and personalities. Make sure potential participants realize the extent of their commitment to the group. One way to add to your group is to invite prospective members to submit work and attend one meeting, after which both decide if the match feels right. Decide where and how often to meet. Intimacy: A group where members feel safe to be completely vulnerable. Nurturing: Members will support each other in reaching their goals. Respect: Members communicate thoughtfully and constructively and have a good ability to listen. Inspiration: Artist members should feel free to share artistic ideas and opportunities. How much time does each person get? Will we use a timer? Can we meet at a time not used for art making? How long will our meetings last? What are your artistic strengths, weaknesses? What would you like to say, create, achieve with your art? What’s your wildest art dream? What do you want from the group? How can the group help? best support your vision? It is good to have an identity for your group. Some groups prefer to “grow” into their name instead of choosing one too quickly.